WASHINGTON, DC -- “Why should U.S. taxpayers be interested in Ukraine?” That’s what Secretary of State Rex Tillerson reportedly asked at a recent meeting in Italy with some European counterparts. 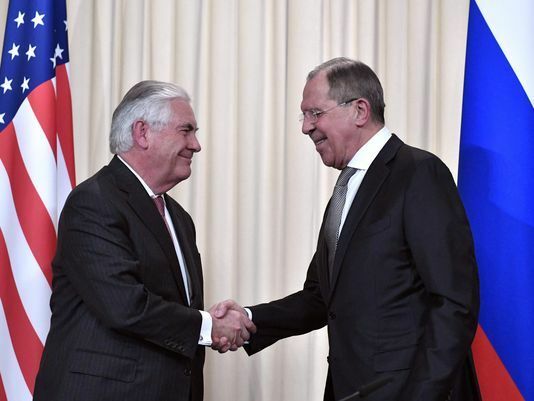 Russian Foreign Minister Sergei Lavrov, right, with Secretary of State Rex Tillerson in Moscow on April 12, 2017. The French foreign minister said he told Tillerson the United States should want a strong Europe. That’s true, but there are many other reasons for Americans to care about Ukraine. First and foremost, the Russian invasion of Ukraine, including its takeover of Crimea and its continued interference in eastern parts of the country, violates the most basic principle of international relations — that borders between countries should not be changed through the use of military force. This is what Saddam Hussein attempted in Kuwait in 1990, and what Hitler’s Germany attempted before and during World War II. Respect for this principle is the bedrock of what peace and order there is in the world. A second reason has to do with Russia specifically. Vladimir Putin’s Russia is a one-dimensional power. Its influence is tied to its ability to dominate others through the use of force, be it military, cyber, or related to Russian oil and gas exports. It is important that Putin not conclude that continued use of force is a viable path to make Russia great again. If he does, he will continue to invade, coerce and interfere. Ukraine’s nuclear history is another reason to care. It was once an integral part of the Soviet Union and a good many of the Soviet Union’s nuclear warheads were located there. At the time of the breakup, there was concern that many of the newly independent states carved out of the old Soviet Union would become nuclear weapon states. That would increase the number of countries possessing nuclear weapons and the odds they would fall into the hands of terrorists. Tillerson can survive this Russia trip. Ukraine voluntarily dismantled its nuclear warheads under a 1994 deal with the U.S., the United Kingdom and Russia. But its subsequent loss of Crimea to the Russians sends a terrible message to other leaders: that giving up nuclear weapons can be hazardous to your political health and territorial integrity. The fact that both Iraq and Libya were invaded after they gave up their nuclear programs — and that a nuclear-armed North Korea has not been attacked — is a lesson lost on no one. And that leads to a fourth reason Americans should care. Under that 1994 agreement, the Budapest Memorandum of December 1994, Ukraine received various security assurances. This was not the same as a defense treaty — Ukraine did not become a member of NATO — but there was no mistaking the intent, to convey that Ukraine could give up nuclear weapons and still remain secure. The assurance has been shown to be empty. A country’s word is its bond, and any time the United States fails to live up to its word encourages adversaries to challenge us and friends to go their own way. Either outcome brings about a world of diminished stability and reduced U.S. influence. The good news for U.S. taxpayers is that their country can afford to be interested in Ukraine and many other international issues. True, the U.S. spends a great deal on its defense, some $600 billion a year. But this comes to just over 3% of what the economy produces, a level far below the average during the decades of the Cold War. Just as important, overseas spending is not money that goes down the drain. As we learned on 9/11, as we learned with Zika and Ebola, and as we learned when Russia hacked our computers during the presidential campaign, nothing stays local for long in a global, interconnected world. What comes from or happens out there will quickly come here, for better and for worse. President Trump campaigned on the theme of America First, and it is of course true that this country faces enormous internal challenges. But inadequate health care and poor public schools cannot be fixed by doing less in the world. Americans already spend more than most others on education and health care. The problem is how we spend it, which is decided by our leaders, whom we choose. Ignoring what goes on in Ukraine or elsewhere in the world will not make us smarter, healthier or richer — but it will make us less safe. Richard Haass is the president of the Council on Foreign Relations and the author of A World in Disarray: American Foreign Policy and the Crisis of the Old Order.